Well. Let's see if I can remember how to do this. It's been two years since I've written anything here, but when Jackson Pope, the nice designer of FlickFleet reached out to the wider community asking for reviewers that like dexterity games, my name came up. (Apparently I haven't done a good enough job convincing everyone else in the world, and thus new reviewers, that dexterity games are truly the greatest kind of game there is. (Well. I mean, I guess if you consider sports to be dexterity games, then I'm in the vast majority of the population as a whole in thinking that dexterity games are the best.)) And then I started hearing things like "new dexterity game" and "flick pieces for movement" and all of the normal things that immediately gather my attention. So here I am. Wow, that was a long winded way to say, "Hi, I'm back for now, but don't expect this to be a regular thing." Ok, fine. 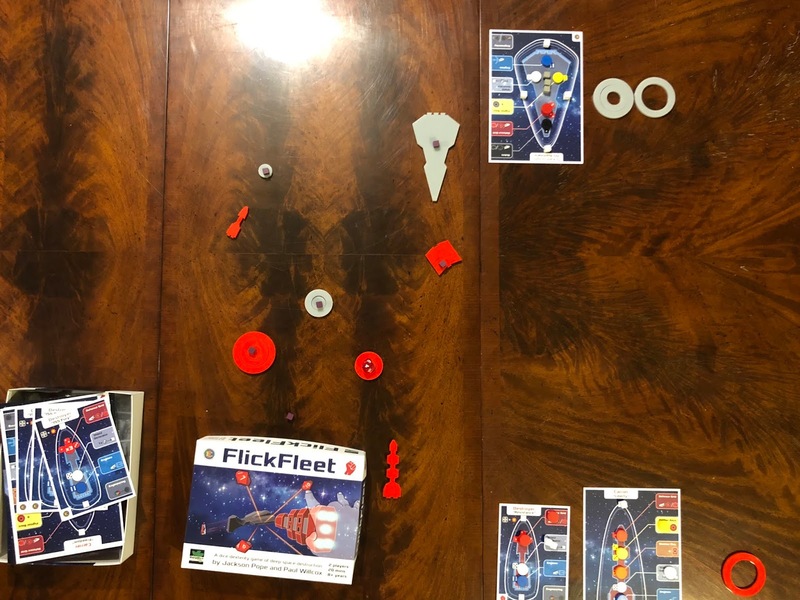 FlickFleet is a new dexterity game about sci-fi spaceship combat. There are several kinds of ships, but they basically take 2 forms - the ones that have a board where you have to track stuff on the side, and the ones that don't. The ones that don't have a board associated with them are called fighters, and they start off with three pieces that fit together, and you track everything about them based on how many pieces remain. When they get to activate, you can move them by flicking them, and then you can attack by setting a die on top of them and flicking it towards your opponent's ships. You get to shoot once per remaining section, and one type rolls a ten-sided die, the other rolls a six-sided die. The second kind of ship is a capital ship, and there are a few different types of them. Each of them has a board to track actions, and they can fire (some of them can do this in two ways and thus can use two actions for it), some can launch fighters, they can repair hull damage and/or shields, and they can move. They also don't always get hit when you hit them with a die, because what face the die ends up on determines if they're hit. A six-sided die always hits, but the ten-sided one only hits on 1-6 (unless you had shields, in which case you're also hit on 7-10, because apparently shields are easier to hit). 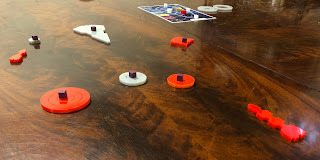 Players alternate taking turns activating ships until all of them have activated, then they start over. And they keep doing this until everyone dies. Wait, that's not right. Only your opponent has to die. If you died too, then you played too long. Sometimes there's a different ending based on the scenario, but for the most part, it's a 'til death kind of situation. Okay, so I've said there's flicking of ships and dice. Is there anything different about this one, or is it basically just a clone of all the other flicking games? Well, there are a few differences that I can point out compared to your standard flicking game. First, there is the dice flicking element. 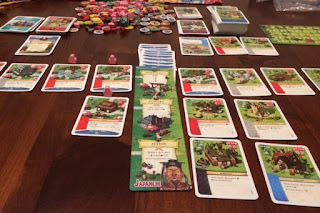 The only other game I know of that has dice flicking is Tumblin Dice, but that one is (at least pretends to be) a bit more strategic about it. 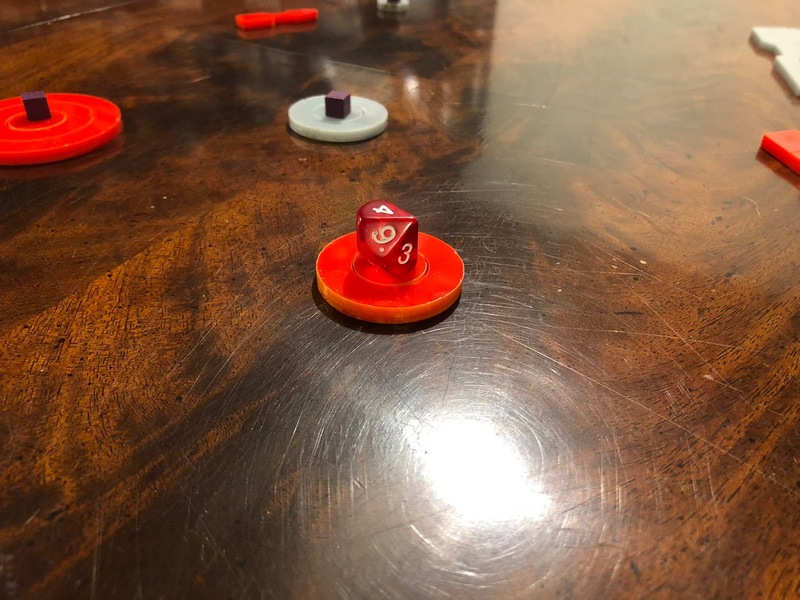 In FlickFleet, the dice flicking is meant to be a bit more random; basically, it's meant to be a combination of flicking and die rolling in a single element, where the die roll affects the outcome of the attack. (That's at least my opinion on it.) 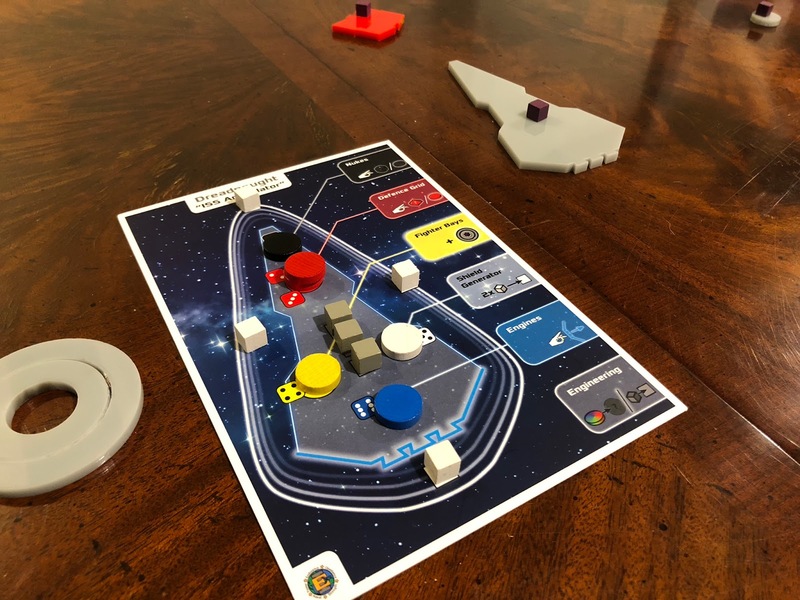 Another difference between FlickFleet and other dexterity games is that there is a strategic component to it in action selection for your (capital) ships. Deploying fighters at the right time, and balancing when to move, attack, and heal can affect the outcome of the game (though this element isn't as crucial as being good at the dexterity element of it, as you probably would have assumed). A heated battle in the works. There are a couple other things I also want to point out before I get into the "who would enjoy it" part of the post. First, you actually have to have some control with your flicking in this game, which I find as a pleasant added challenge. Specifically, if you flick your ship off the edge of the board, it just flat out dies. So, don't do that. But, when you are flicking a die at a ship, if the die goes off the edge of the board, then it's a "wild shot" and misses completely. So, you shouldn't just blast it as hard as you can, like you might be tempted to do in some other games like PitchCar or Catacombs. 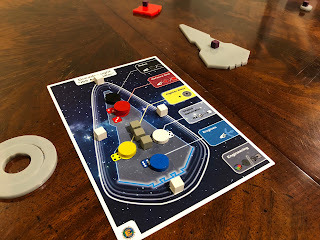 Second, FlickFleet has a handful of scenarios (four in the prototype that was sent to me, but I think they're planning to expand that online after launch). 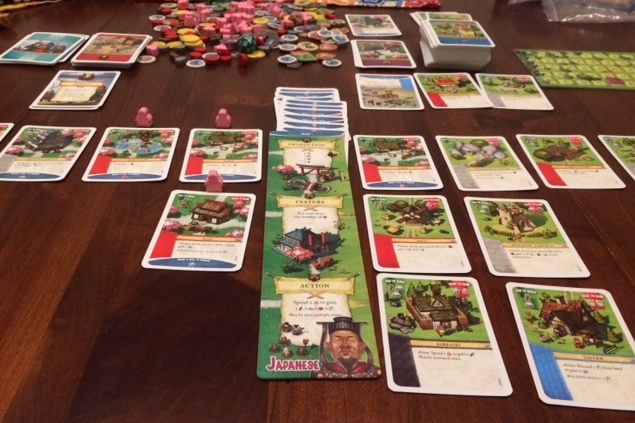 The scenarios let you have a little bit of variety in how you play. They don't really change the crux of the game, but they add enough variance that it doesn't feel like you're doing the exact same thing each time, and they can also affect how you approach the strategic element of the game, which is nice. So, for the part you actually care about. Who would enjoy FlickFleet? Dexterity fans that like to be able to customize their game from play to play. You can customize the setup with scenarios and with building custom fleets (there is a costing system provided for figuring out how to balance the number of ships in each fleet). Dexterity fans in general. Let's be honest. This is who the game is meant for. Getting ready to shoot. This "should" be an easy shot. People who hate dexterity games. But, if you hate dexterity games (the best genre of games as we've discussed earlier), did you really get this far in the post? People who want the person who is better at dexterity games to win every time. If you are just plain better at flicking than your opponent, then yeah, you'll win most of your games of FlickFleet. But if you hit them with a 7-10 every time you flick the die, you'll lose. People who believe "when it's dead, it's dead" about destroying their opponent. Since I only briefly mentioned this earlier, I should elaborate now. The capital ships have shields. One of the actions you can take with them is to repair your shields. This can lead to situations where a ship keeps healing all of it's damage, and their opponent feels like they can't finish it off. More specifically, it can also lead to situations where their opponent can't finish it off (if they are only firing a single shot each round; just concede, my friend). Not everyone will love the ability to repair the shields. Though, frankly, its easy enough to create a scenario where there's some kind of "spatial anomaly" that prevents shields from being repaired, if you really hate shields coming back. Overall, I enjoyed my plays of FlickFleet. That shouldn't surprise anyone. If I find a lot of dexterity gamers in my gaming group, then I could see it continuing to hit the table, but for people that aren't partial to dexterity games, I typically go with goofier ones like Coconuts when I occasionally convince them to dip their toe in the beautiful waters of dexterity. So my continued play of it will depend pretty heavily on who I am playing with. If FlickFleet sounds like something you'd like, then check it out on Kickstarter. I would like to thank Jackson Pope of Eurydice Games for sending me a preview copy of FlickFleet.